Ever page or post you create in WordPress also creates a Permalink. Truth be told, the default Permalinks created by WordPress are not very user or search engine friendly. The best scenario is to set your Permalinks properly before you launch your site. If your site is already, live, I’ll cover that for you in detail later in this article. The good news is WordPress provides you with the flexibility to modify your site’s permalinks to fit your needs. You can read all about Permalinks here. Permalinks are the permanent URLs to your individual weblog posts, as well as categories and other lists of postings. A permalink is what another weblogger will use to refer to your article (or section), or how you might send a link to your story in an email message. Because others may link to your individual postings, the URL to that article shouldn’t change. Permalinks are intended to be permanent (valid for a long time). The above is referred to as “ugly” — even by WordPress. This structure doesn’t tell you anything about the content at a glance. Not to mention search engines are not too keen on that structure either. Let’s solve both of these issues! This will instruct WordPress to use the title of your post as the URL instead of the funky characters, numbers or other date related options. Much better, yes? That’s what is called a Pretty Permalink. “Pretty” Permalinks is the idea that URLs are frequently visible to the people who click them, and should therefore be crafted in such a way that they make sense, and not be filled with incomprehensible parameters. When you visit the Permalinks page you’ll see that you can customize down to the hour, minute and second. After all these years I’ve yet to run into a site that needed that level of Permalinks! 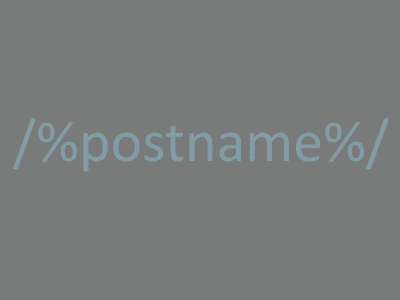 I advise my clients to stick with the simple post title /%postname%/ structure. Rare is the occasion to use otherwise. If we are talking Permalinks, I do have to mention that there are other options. I’ll only cover those that have potential based on your focus. Depending on the topic of your site or blog you may want to include a date or the category in your Permalinks. Day and Name: Includes the date, year/month/day and post name. Month and Name: Includes the date, year/month without the day and post name. You can also use /%category%/%postname%/ to include your category name. On your Permalinks page you’ll see the options below the Custom Structure field that you can click and add in any order you want. But don’t. This is one of those just because you can doesn’t mean you should situations. 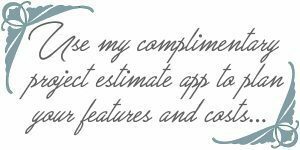 You want your Permalinks to as be short, sweet and descriptive as possible! The longer the Permalink the less user-friendly it becomes. When visiting the Permalinks page, the options can be overwhelming — and overkill for most websites. Sticking with /%postname%/ is what I recommend. This will add the post title after your domain name providing readers with a user-friendly URL. SEO TIP: By including your primary keyword in your post or page title it is then also in that page/post’s Permalink too! Great for SEO. But don’t over do it! Read more about SEO here. Is your site already live? 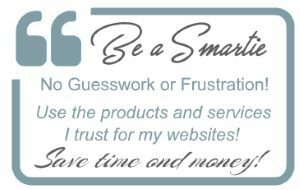 What if your site is already live and you want to change your Permalinks? That’s an important question if you have any URLs that are “out there” or ranked with search engines. 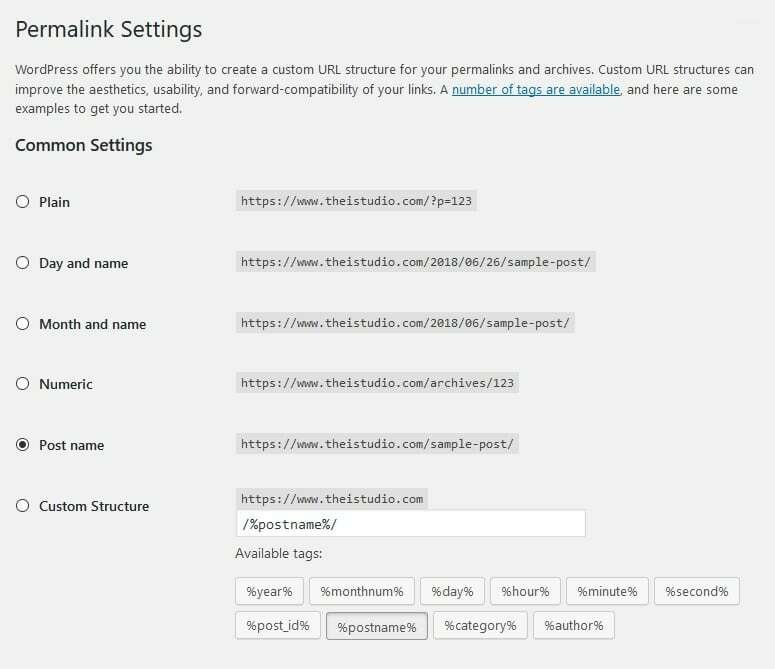 Changing your Permalink structure does in fact change all your site’s URLs. If you find yourself in the position to want to change your Permalinks, there are a couple steps you need to take. First do a thorough backup of your site. Next we want to find the links within your site content that have the old Permalink structure and update them to the new structure. We do want to minimize redirects as much as possible as that can be a performance issue. Because we are doing a site-wide redirection and there may be some stragglers or links to your site that you are unaware of, we want to customize our 404 page (page not found) to be more user-friendly as well. You can see what mine looks like here. Then install the 404 to 301 plugin that will redirect any URLs you overlook or are not aware of to your new fancy helpful 404 page. Resubmit your sitemap to Google as a nudge to discover your new URL structure. By following the above steps you have your best shot at not negatively impacting your search engine rankings in the process. You’ll then have Permalinks that are SEO’d and readable. And that’s a pretty thing!